With a city-wise presence in Mumbai and Delhi, Blossom Kochhar Aroma Magic pioneer in aromatherapy and natural skincare. With this, the brand is gradually increasing its geographical presence in the country, though already has adequate retail presence. Nature inspired skincare and beauty brand Blossom Kochhar Aroma Magic has announced its first standalone kiosk launch in Pune’s SGS Mall. 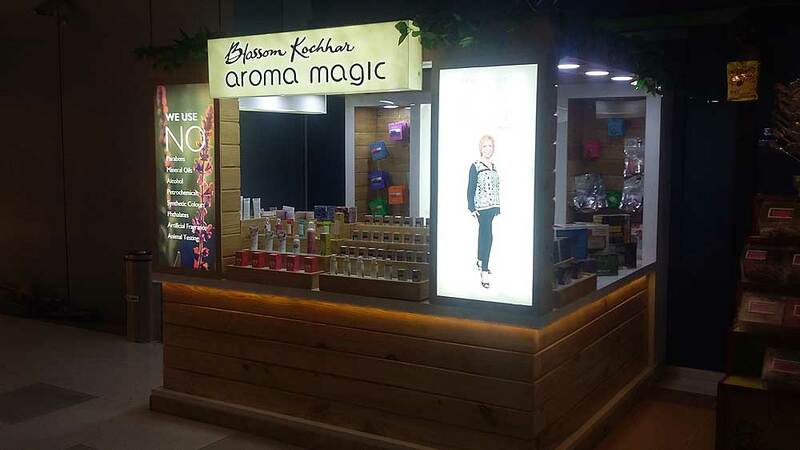 With this opening, Blossom Kochhar Aroma Magic increases its standalone presence to two exclusive standalone kiosks- one in Delhi and other in Pune. The kiosk will showcase all the eminent nature derived products. In the spirit of being the change the brand wants to see in this world and in the beauty and wellness industry, Blossom Kochhar Aroma Magic has decided to launch environmentally conscious kiosks in the country. The Pune kiosk is the first initiative of its kind, that endorses the brand’s green mission of being responsible and reducing the stress on the environment. The interiors of Blossom Kochhar Aroma Magic kiosk are carefully done, keeping the brand’s ethos in mind. The kiosk is exclusively designed keeping in mind the brand vision of going green. The interiors are made of pine wood, adding a tangent to natural dimension & entire look and feel of kiosk revolves around the theme - go green , go natural. Located in Pune’s SGS Mall, on the ground floor, Blossom Kochhar Aroma Magic will offer complete range of its product portfolio. The brand endeavours to bring to their customers superior products, following the rules of Aromatherapy and guarantee the best quality product while respecting people and environment. “This is an important market for us and we are looking forward to engaging the savvy consumers in the city with a host of exciting new products and events in the upcoming months,” noted Dr. Kochhar. Blossom Kochhar Aroma Magic is a brand that offers true beauty and well-being through a wide array of natural and authentic Skincare, Body Care and Hair Care products. The brand’s work is a thoughtful balance and harmony of substance and style, nature and science, people and spirit.